2 Simple and Purple Mash Help - Can parents see their child&apos;s work? All Categories ​>​ Purple Mash ​>​ FAQs ​>​ Can parents see their child&apos;s work? Can parents see their child&apos;s work? Purple Mash has its own parent portal which allows parents and guardians to see all the exciting pieces of work their children have created in Purple Mash. For parents to activate their parent portal, they will need to use the parent code that is included on their child's login card. 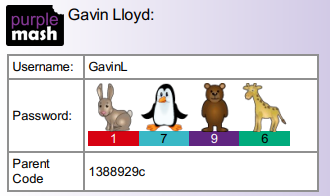 The best way to share this information with parents is by sending them the letter you can generate from Purple Mash which will include both information about Purple Mash and the login card and information regarding Purple Mash. 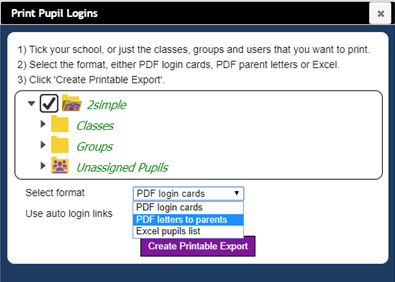 You can do this from "print pupil logins" under the admin cog and be sure to select "PDF letters to parents". Enter the Parent code alongside the child's first name initial, an email address (will be used for subsequent logins) and the relationship to the child. If a parent has more than one child in the school, they will need to register for each child separately using the separate parent codes. However as long as the same email address is used, the parent accounts will merge meaning you can see all associated children from the same portal. How can I save Purple Mash work onto my computer?